Counting only about 30 000 people Dubrovnik is the cultural and social centre of the region, the County of Dubrovnik-Neretva, and Croatian most famous city. The extent of the County of Dubrovnik-Neretva roughly corresponds to the boundaries of the proverbial Dubrovnik Republic, the aristocratic maritime republic that excelled in culture, architecture, arts, and sciences for five centuries until its demise in the 19th century. Warm Mediterranean climate, cultural abundance, and natural beauty of the region are only a few of the points that make Dubrovnik an appealing destination. 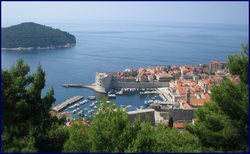 Average yearly temperature for Dubrovnik is 17°C (63°F), or 10°C (50°F) for winter period and 26°C (79°F) for summer period. The summers are long and dry with plenty of sunshine while the winters are gentle and mild. All along the Dubrovnik coast, the sea is wonderfully blue and clear. During the summer average sea temperature is above 21°C (70°F). Throughout centuries Dubrovnik always depended on the sea so it's no surprise that fishing, seamanship, and sea cuisine are an essential part of local culture and come almost like second nature to the local population. The people of Dubrovnik, being proud and hospitable, will assist you in any situation, tell you stories of their city and of the sea. Most of the locals talk at least one foreign language. Vegetation in the region is typical, mostly Mediterranean, and is a result of hundreds of years of human influence. As suited for a merchant harbour city, Dubrovnik mariners traveled far and wide bringing home many tropical and sub-tropical cultures, thus creating an interesting mixture of plant life. Today, you can enjoy in the sight of citrus and apple trees, palms and agaves alongside pine and olive trees, and other various beautiful flowers and shrubs growing in many gardens, parks, and city's green surfaces. 4. Croatia has a long and indented coast with more than 1200 islands. 1. Dubrovnik lies on the Adriatic Sea, part of the Mediterranean Sea. 2. The name of the most famous street of Dubrovnik is Placa (Stradun) street . 3. For more than five centuries Dubrovnik had its own Republic. 4. Dubrovnik Republic was the first nation to recognize the independence of the USA. 5. Dubrovnik region area is completely non-industrious.